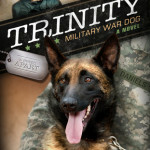 I love Ronie Kendig’s books and “Trinity” is no exception. In this book, Ronie gives us a glimpse into the lives of military war dogs and their handlers. We don’t hear much about these amazing members of our military. They give their lives (both human and canine) to fight for our freedom. “Trinity” was a truly wonderful book. I love romance, and this has it. I love a little suspense (occasionally), it has that too. I’ve never been much of a fan of “military” books, but the excellent writing within Ronie’s novels has changed my opinion. I may never pick up anyone else’s military books, but I will be coming back time after time to anything Ronie Kendig writes. A year ago in Afghanistan, Green Beret Heath Daniel’s career was destroyed. Along with his faith. 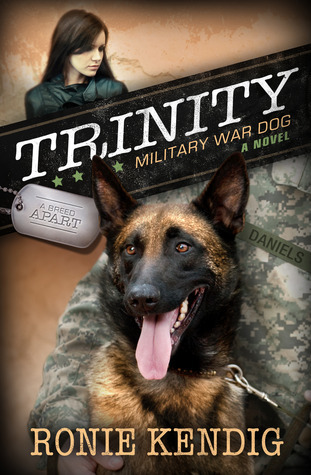 Now he and his military war dog, Trinity, train other dogs and their handlers. Though his passion is to be back in action, the medical discharge has forced Heath—and Trinity—to the sidelines. Military intelligence officer Darci Kintz is captured while secretly tracking the Taliban. Only one dog can handle the extreme conditions to save her. Trinity. Only one man can handle Trinity. Time is running out on the greatest—and most dangerous—mission of their lives. 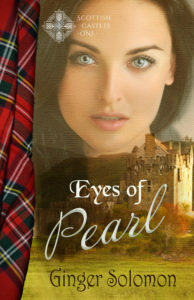 Click on the Amazon link and help support this blog. They are awesome. She has me hooked.